Which filler metal is best for an application depends primarily on how the finished weld will be used and/or the service conditions it will encounter. Does the weld need to withstand high temperatures? Is toughness, strength or ductility the main priority — or are all three important? Filler metal manufacturers can formulate their products with elements to achieve these mechanical properties and, at the same time, reduce potential costs for rework by ensuring a high-quality weld the first time. The addition of deoxidizers in filler metals can minimize costs by lessening the need for non-value-added activities such as pre-weld cleaning and grinding. This allows welding operators to spend more time welding, generating higher levels of productivity and profit. Added deoxidizers in filler metals allow welding operators to weld over oils, rust, mill scale and similar contaminants commonly found on heavy-scaled plates such as hot-rolled steel used in structural applications — without the need to grind or clean before. By minimising a pre-cleaning step, companies can save the cost of not only labour, but also the expense for grinding equipment purchases and maintenance, and for purchasing and inventorying grinding wheels. Added deoxidizers in filler metals can minimise the pre cleaning step and allow welding operators to weld over oils, rust, mill scale and similar contaminants commonly found on heavy-scaled plates such as hot-rolled steel used in structural applications — without the need to grind or clean before. Filler metals with added deoxidizers also allow companies to use less expensive base materials, as steel that goes through extra processing to remove mill scale ahead of time costs more. Deoxidizers work by acting as scavengers that combine with oxygen and then, as the weld metal cools, they diffuse with the oxygen to the surface of the weld. This action allows the filler metal to weld smoothly through mill scale or rust without compromising arc quality or welding performance, and without concern of inclusions in the completed weld. There are three primary elements that manufacturers use as deoxidizers: manganese, silicone and aluminium. Occasionally they also use titanium or zirconium. Manganese, along with providing reliable deoxidizing capabilities, also increases strength in the completed weld. There are some health concerns around the addition of manganese, however, so it is important to have proper weld fume management in place such as a weld fume extractor or powered air purifying respirator (PAPR). There are also low manganese flux-cored and metal-cored wires available in the marketplace to address safety and compliance concerns associated with manganese exposure in weld fumes. As an added deoxidizer, silicon also provides good weld metal fluidity so that the filler metal wets into the toes of the weld for complete fusion and produces a smooth, flat weld bead. Depending on the type of filler metal, there may be more or less silicon in it; the more there is, the more fluid the weld pool will be. Upon cooling of the weld, the silicon will rise to the surface in the form of small silicon islands or silicates that can typically be removed easily with a wire brush. Silicates are formed when silicon, manganese, iron and oxygen combine. These are prevalent in metal-cored wires, such as those classified as American Welding Society (AWS) E70C-6M H4. Aluminium is most often used as an added deoxidizer in self-shielded flux-cored wires to aid in slag formation. However, too much aluminium in a filler metal can make the weld brittle because the higher the content of this element, the more limited the low temperature toughness is. In general, filler metals with high amounts aluminium do not typically offer much, if any, impact toughness. Deoxidizers act as scavengers that combine with oxygen and then, as the weld metal cools, they diffuse with the oxygen to the surface of the weld. Although they do not contain an internal flux of elements like metal-cored or flux-cored wires do, solid wires are also available with added deoxidizers. These come in the chemistry of the “green rod” or raw materials used for the wires. AWS ER70S-6 wires tend to have slightly more deoxidizers than other solid wires, except for ER70S-2 wires. The difference is that the latter has lower levels of manganese and silicon, and use titanium and zirconium to help maintain strength. Typically, the specifications for a given welding application will indicate which AWS classification of wire is needed. Within that classification, manufacturers may add varying amounts of deoxidizers, which impact the performance characteristics of the filler metal. Some welding operator preference comes into play as one wire may perform slightly better than another of the same classification. 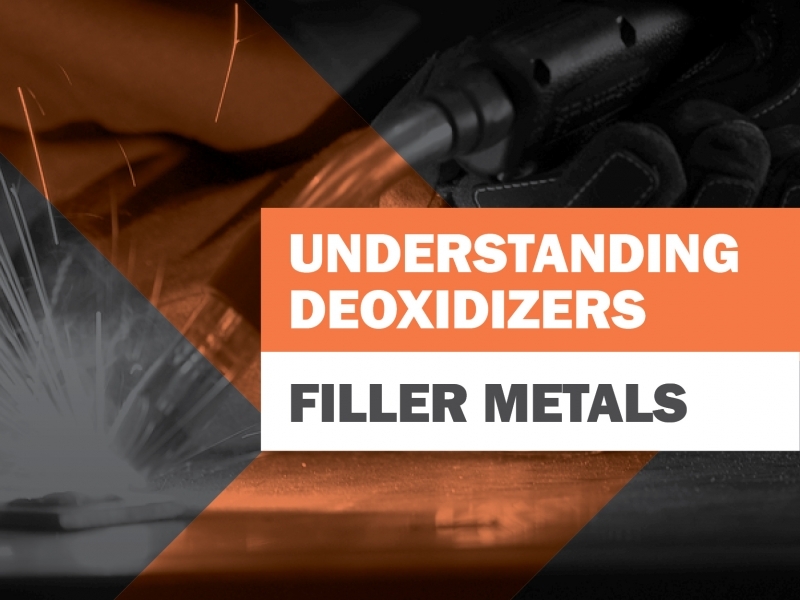 Different gas mixtures can also impact on how filler metals with added deoxidizers behave. Higher argon mixes with lower amounts of CO2 tend to operate better with filler metals that have high levels of deoxidizers and can help lower the silicate formation. For example, gas mixtures that are 75 percent argon and 25 percent CO2 offer a higher silicone formation compared with a mixture that is 90 percent argon and 10 percent CO2 for a given base material. Similarly, gas-shielded flux-cored wires with added deoxidizers tend to offer better weldability and a more stable arc than a self-shielded flux-cored wire with the same amount, particularly when paired with a shielding gas with lower CO2 levels. Base material condition affects the amount of silicon island formation in a completed weld — a clean plate (left) generates fewer islands, while a plate with mill scale creates more. These can typically be removed easily with a wire brush. Regardless of the type of filler metal used — solid, metal-cored or flux-cored — selecting one with added deoxidizers could positively impact the efficiency and cost savings in a welding operation, while also providing the quality needed. Take care to find the product that offers both the performance and mechanical and chemical properties needed to gain the best results.